Leading Hotels of the World has a monthly newsletter that showcases hotels across several international markets – and it presented a few big challenges. First, it went out in six different languages. Second, styling the email across variations and international markets caused consistency issues, resulting in newsletters that were not always on-brand. Finally, creating the newsletter was time-consuming, taking weeks to put together. 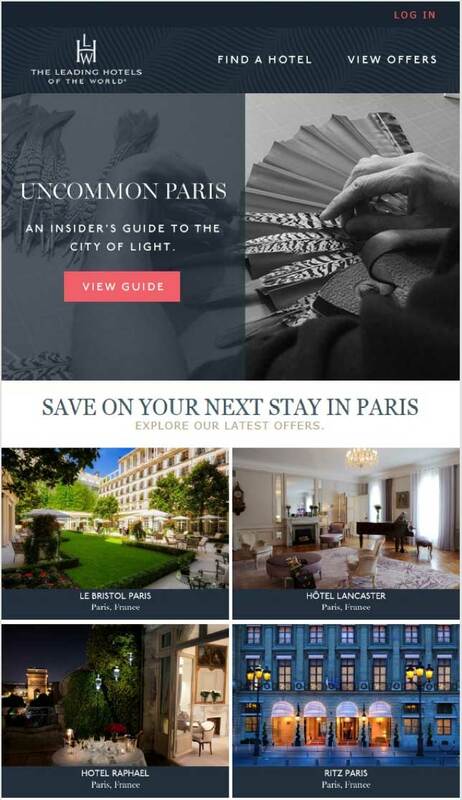 Using Movable Ink’s web crop app, LHW was able to automatically pull in specific hotel information, images, and website information directly into their emails. Instead of piecing emails together by hand, they could replicate their website experience right in their emails so that every message was consistent with LHW’s branding. They could also dictate exactly how they wanted the content to render specific to the email with highly customizable and visually on-brand content. Movable Ink helped us increase efficiency and greatly improved our email production process. We were spending about 10 minutes creating each hotel section in every email. Now we spend less than a minute.